When looking at the California Coast, even the most discerning traveler has access to some of the most beautiful resorts in the world. One finds everything from lush vineyards, to cliff crashing waves, to world-class dining & spa options. Here are our all-time favorites... each can be custom-planned around your personal needs and itinerary by our Trusted Friend & expert travel consultant Stefanie Behrens at ALTOUR Los Angeles. Stefanie’s connections add amazing value to each property such as complimentary breakfast, room upgrade and spa credit. For such a large resort, sitting on 250 acres, Meadowood in Napa Valley has the ability to make anyone feel at home. This beautiful hotel located in St. Helena offers such cozy luxury that it is impossible to not find ultimate relaxation. Not only can guests visit numerous vineyards nearby, but the estate’s fine dining establishment, The Restaurant at Meadowood, is among the finest in the valley with such detail, beauty and amazing taste! The chef is also quite cute, as well! Who knew that California could have its very own slice of Scottish-like beauty! The Ritz at Half Moon Bay represents fabulous food, one of California’s most beautiful golf courses, and understated good taste in the most inviting form. My favorite memory of this getaway is sitting outside at sunset, enjoying my beautiful private fire pit. I sat there watching the final golfers fight for the best putt at the 18th hole while enjoying the sounds of children’s anticipation of the coming evening, so they can finally enjoy their smores, and listening to the resident bag pipe player. His song charmingly alerts the guests that it’s almost sunset, and the best chance to catch the optimum view. This property is one of the most magical, unique, and special hotels that I have ever seen: nature walks, yoga, and true relaxation make every moment an adventure. There is a natural feeling about Post Ranch that creates the most serene setting where one feels connected to nature, fueled by creative energy, and peaceful beyond belief. The grounds exude positive energy with their unique, individual and organic architectural design. There is everything romantic about the Santa Barbara area. I loved the manicured grounds, the smell of lavender in the air, outdoor showers on my private patio, five-star grace and service, the chirping of birds, and a beautiful stillness that made me feel incredibly welcomed and thoughtfully prepared for. San Ysidro Ranch made me feel instantly relaxed. And dining under the stars in the lantern-lit garden area of Stonehouse is an experience not to be missed! You cannot make a trip to California without visiting Los Angeles... and if you are going to visit LA, then staying at The Peninsula Beverly Hills is the swanky way to travel. The hotel is located in the heart of Beverly Hills, making it the best location for premier shopping, a manicure at Olive and June and spoiling a diet on Sprinkles cupcakes! After a long day enjoying the sights, there is no better way to re- lax than visiting the stunning Peninsula Spa, a hidden gem nestled among the hustle and bustle of Rodeo Drive. “Shutters, where nothing stands between you and the sand.” Their amazing tagline is completely true. Shutters is the place for a perfect beach vacation. Visitors can walk Ocean Blvd and find a variety of Santa Monica’s delicious restaurants, or even taking a stroll in the sand towards Venice Beach to enjoy a more eclectic atmosphere of art and style. Shutters itself is completely low key and high style with its white trim and wooden decks, all the while exuding casual elegance with patrons wearing Tieks and eating lobster. 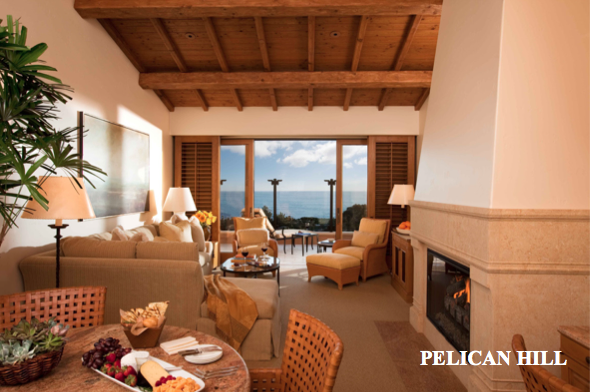 World-class golfing, spacious bungalows starting at 850 square feet, gorgeous pools (including my favorite, The Coliseum Pool) and an award winning spa that would relax even the most preoccupied individual are all part of why I love Pelican Hill. As soon as you pull in the drive of this amazing property, you immediately decompress enough to start enjoying the atmosphere around you. I love that I can park my car in front of my private bungalow, walking into a polished guest room with a residential- Italian design and decorated in a warm, soothing color pallete. Imagine enjoying a chilled glass of white wine on the beautiful balcony overlooking the magnificent Pacific Ocean. Oh, and did I mention the most beautiful sunset I have ever seen? 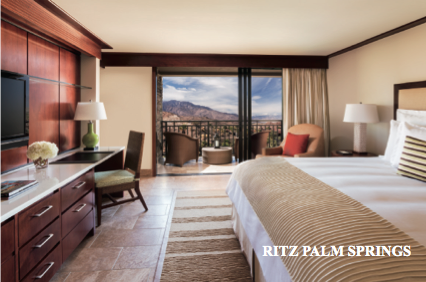 It may be hot in the dessert, but we are certainly thankful to have The Ritz Carlton Rancho Mirage back in the picture! Outside of the craziness of Coachella and Stage Coach, Ritz Carlton Rancho Mirage has some of my favorite California views. The beautiful juxtaposition of desert and mountains affords a unique and distinct sunset that I never get tired of. Speaking of being tired, after a long day of golf, my favorite thing to do while at The Ritz Carlton is to visit the spa, which embodies the pure essence of Palm Springs, with its natural rock terraces and tranquility pool. Rancho Valencia is the perfect destination for an array of clientele. I would love to go on a girl’s getaway here, where we can utilize the perfect spa, a session in the yoga pavilion and cocktails in The Pony Room (the staff outfits are amazing!). But I would prefer to travel with my significant other and enjoy lounging in our stunning casita with private patio and Jacuzzi. There are too many options for this romantic, subtle, fairytale- like oasis in the picturesque canyons of Southern California. Not to mention that you can “borrow” a Porsche to head down to La Jolla for lunch on the beach! Hotel Del Coronado is like stepping back in time. Walking the halls of Hotel Del, you can appreciate its authenticity as the second largest wooden structure in the U.S., as well as a National Historic Landmark, since the hotel opened in 1888 (there may even be ghosts lurking around...). The Beach Village at the Del is an extension of the main hotel and its impressive accommodations include private check-in service to the gated grounds, making this is an ideal option for privacy and class. Both properties offer poolside cabanas, delicious din- ing options, and now the hotels are offering a full-service beach concierge.